J.S. Bach (1685-1750) lived during the same time as Tokugawa, Yoshimune the 8th Shogun of Japan (1683-1751). Bach's legacy of great music has been treasured by everyone, performers and listeners, up to the present day. Modern wind instruments, however, were a product of the Industrial Revolution. During the nineteenth century, constant mechanical refinements were taking place on these instruments, and it wasn't until the beginning of the twentieth century that these mechanisms were finally standardized. This has caused a dilemma for musicians who have long desired to play Bach's original scores on modern day wind and brass instruments. It may be possible for a piece written by Bach for a single string instrument to be played by a single wind instrument, which can cover the same range of the original one and with the player's strong artistic devotion. But biologically speaking, this wind player would have to be an ultra -super human being to knock off such a piece in its entirety, which has no rests at all during the course of its several pages long first movement, followed endlessly by the other similar movements. Many of us can not make it, or would have already got knocked off in our brief playing career. We all know that J.S. Bach himself often transcribed pieces written for one instrument to another instrument. For example, when his E major Violin Concerto BWV-1042 became a Harpsichord Concerto BWV-1054, the key was changed to D major to get more sonority. And the 3 -notes theme for violin was turned into a 9-notes theme for harpsichord. Because of the instrumental nature, a harpsichord could not sustain a single note long enough to carry on his phrasing forward as he wished. It seeems Bach did not demand harpsichord to be an ultra-super one, but sensitively understood the nature of the instrument. If the Industrial Revolution had occured 250 years earlier, and if he were familiar with our modern winds and brass, would he have transcribed a single string instrumental piece to a single wind instrumental piece? May be with a plentiful amount of rest? At the same time, one wonders if J.S.Bach had been borne in 1935 instead of 1685, would he have refused to have his music played by Segovia's guitar? Or would he have prohibited the sales of Glen Gould's Goldberg Variations compact disc because they are not played by a lute, viola da gamba, or cembalo? With these facts, questions, and a dream to play Bach's music with our biological nature, the concept of the BACH-BAND was born. It is designed to be a time machine to fly back to the days of Bach, or further more into his heart with our modern wind and brass instruments. The instrumentation of the BACH-BAND consists of those instruments considered to be the furthest removed from Bach's original instrumentation. The BACH-BAND employs clarinets, saxophones, trumpets(cornet/flugel horn),horn,euphonium, trombone, tuba and string bass. When the group is expanded to ful size, the number of players in the band is 13 to 14, like that of W.A.Mozart's Grand Partita, K.361, or the R.Strauss's 13 winds Serenade, op.7. The function of each 13 or 14 soloists in this ensemble is just the same as that of a big band in jazz. 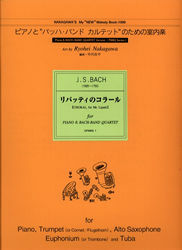 The scores of Tokyo BACH-BAND were realized into live sound for the first time, with the heartful support and care of Michio SUGIHARA, in December of 1993 at the Bach-Hall in Miyagi, Japan, on land once governed by the 15 successive Shoguns. 3. As soon as we have confirmed your payment, we will ship your order and let you know by email that we have shipped it. *In order to make your payment, you must first register with Pay-Pal. Please view the website for Pay-Pal www.paypal.com/ for instructions on how to register and make payments.